I apologize for the tardiness of this post. The site was down for some reason last night when I attempted to post this. 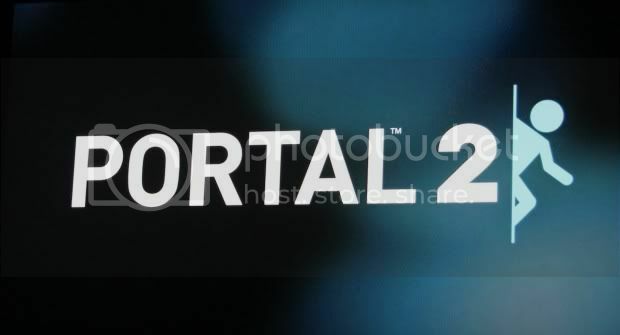 So, Portal 2 is finally out, and I finally got to play it for a few hours. This isn’t an official review, as I haven’t tried out the multiplayer yet, but simply my thoughts on the single player thus far. Basically, if you like to laugh, have a brain, and are in possession of some sort of machine capable of running this game… you should play it. I won’t say you should buy it, as I’ve read the playtime and replayability is negligible (I’ll be playing through it at least twice on both multiplayer and single player… so, four times minimum), but from what I’ve played thus far, you need to play this. The game starts you off with the humor of the new character you may or may not know about (his name is Wheatley, and he is voiced by Stephen Merchant), and epic techno beats that are resemblant of Daft Punk’s work in Tron Legacy. 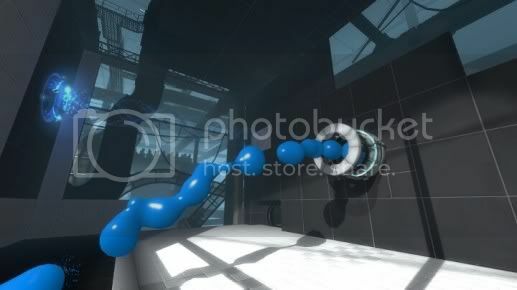 Then you are reacquainted with an old friend, and are more or less taught the ways of the portal gun. Hilarity ensues. Where the game really excels though, aside from the puzzle work, is making me feel connected with the characters. Each one has their own charm that makes you smile, regardless of being “good” or “evil”. Not to mention, some of the sequences I’ve experienced are so engaging that I actually forget I’m playing a game (I did what I used to do when I was 5ish… duck or move in real life to avoid something on the television). The mechanics work well from what I can tell. There are a few glitches, but that’s to be expected when you can run out of walls and wind up somewhere else. And I’m not writing them off because of that, I’m doing it because they are minor and easily fixable by yourself. Chris mentioned being worried about using dual analogs versus a mouse and keyboard, and I can honestly say it hasn’t proved an issue in the slightest bit. Of course those that play on PC will argue, but if you are accustomed to console controls, you’ll be just fine. As for difficulty… so far it’s been easy. I’ve had a few moments where I had to stop to think with the propulsion gel (orange goop) puzzles, but other than that, it’s been fine. If you were worried about the game being to mindbogglingly difficult, rest assured that the first few hours are EXTREMELY straight forward. As for the Steam integration in the PS3 version… it works beautifully, for what I’ve done with it. Have yet to play online with someone through it, but the syncing process with my Steam account lasted… 20 seconds. And then I was able to just press the “select” button at pretty much any point that Portal was booted up, and I could check News concerning Portal 2, friends that were online, chat with said Steam friends, etc. I’m eagerly anticipating what level this will be brought to in the future, as this is crazy awesome. Sony did a great thing partnering with Newell here. Look forward to a more indepth review later on. If you want to play multiplayer with me, feel free to add me. Leonhearfs is my PSN, leonharfs is my Steam.